Concealment is key and A.S.A.T. 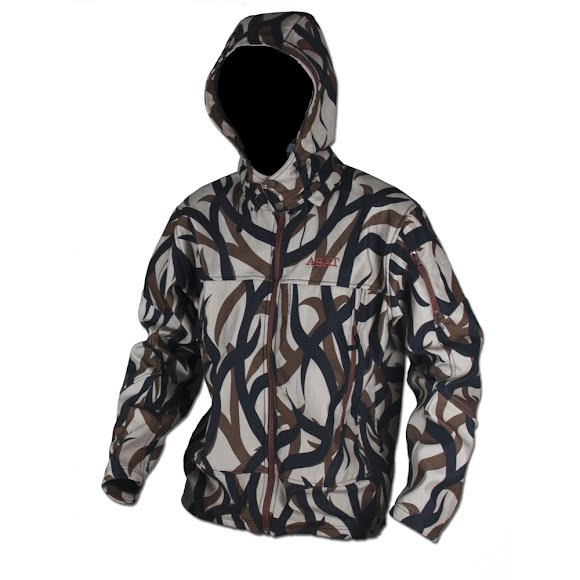 Camo offers the Lightweight Bowhunter Jacket for Eastern and Western hunters alike, working to break up your silhouette, keep you comfortable and reduce natural odors from your body for increased success on the stalk. 2 pack friendly slash handwarmer pockets. Removable zippered hood with double snap closure and elastic draw string/toggle ties. The super-hydrophobic surface structure of the Lotus leaf allows it to repel water and dirt in some of the planets most challenging environments. The Lotus NanoBarrier fabric treatment imbeds nano particles into the cloth, bionically duplicating the leaf of the Lotus. The durable, eco-friendly barrier allows natural body moisture to escape while blocking rain, other external moisture and debris. Nano silver Technology kills bacteria to virtually eliminate human odor. Anti-microbial formula requires no special activation and will not wash away in the laundry. WOW this is a awesome jacket. It has a removable and cinchable hood which will be great in inclimate weather, side zipper vents for extra breathability and soft quiet material. This will be perfect for cooler weather/morning dove hunts or fly fishing. It fits true to size. I ordered the large and it fit perfectly, with room for light to mid weight layering. It has nano technology water repellant so it should perform well in light rain or damp situations. Great value and quick shipping. I could not be happier! Very effective treestand pattern on a high quality garment. Worn by itself with a moisture wicking base layer, it is terrific in warmer temps with the hood removed and the armpit vents open, and I've worn it in temps down to 17 degrees F with proper layering underneath, and though a bit chilly, I was able to stay on stand for 4 hours. I've only been spotted one time over two seasons using this camo pattern, having a spike buck stare me down twice in one morning, but as I didn't move, he relaxed each time and continued feeding. I do recommend ordering one size larger than you typically wear, as I'm normally medium, and my dad is normally XL, but we each had to return the product for one size larger.